Retail spaces of 745 to 1,489 square feet available at $1.00/sq.ft NNN. and $1.05/sq.ft. NNN in next year. Upstairs office spaces of 690 and 900 sq.ft. available at $1.60/ sq.ft. modified gross per month. Freeway visibility on Grand Ave near San Marcos Blvd. Near Restaurant Row,Fry's,CSUSM,Palomar College,Creekside development. Quilt shop, bookstore, yoga, office, day care, acupuncture and massage on site. 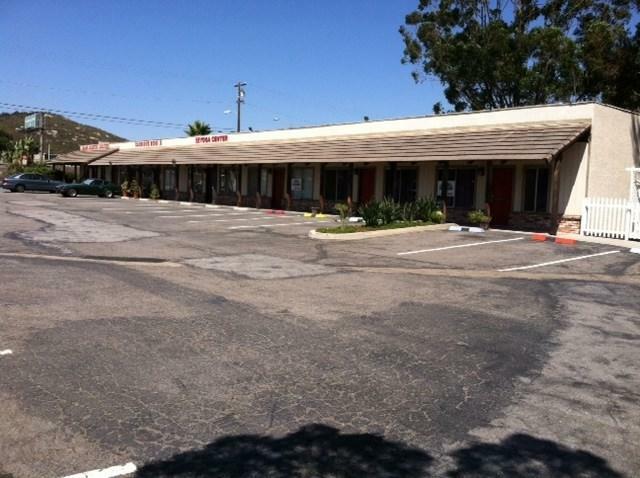 Tenant improvement allowance of $2.00 per square foot per year of lease up to a maximum of $7.00 per square foot. 5.4 parking spaces per 1,000 sq.ft. of building area. Freeway ADT 139,000. Grand ADT 8,600. Easy access. Half a block from San Marcos Blvd. New storefront doors. Suitable tenants include restaurant, barber, specialty retail, doughnut shop, deli, specialty foods, hair salon, florist, internet sales, locksmith, repair service, insurance, brokerage,coffee or tea shop, office.